Big Man Japan has put me at a roadblock. Here is a movie that is almost unexplainable, meaning that if I were to explain to you what this movie is about all the fun you would have had will go out the window. This is a movie that has to be seen to be believed. But as a reviewer, it is my duty to tell you, only whether I liked the movie or not, but to give you some idea of what the movie is. I have chosen to give you my thoughts and leave the rest up to you. 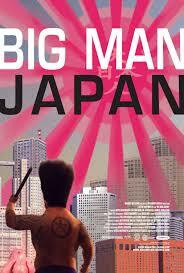 Big Man Japan is a spoof on giant monster movies. But it is not exactly the type of spoof that you are used to. Yes, there are a lot of gags, but the movie works up to them. It doesn't take the cheap road and throw fifty gags at you, hoping that one or two of them stick. It takes one gag and nurtures it until it is really funny and then moves on to the next one. That's not to say that this movie doesn't have cheap gags. There are plenty of cheap gags, but the truly funny ones are the ones that are earned, not given away.